Happy baptismal kit for boys and girls. Beautiful animals adorn the candle tied with a thick cloth on fabrics in earthy tones of coffee. The yellow details in the sneakers animals give light and liveliness. 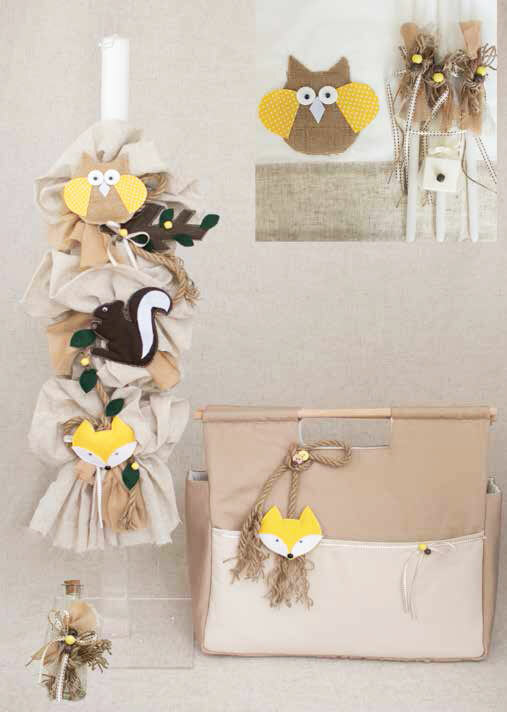 The big bag is brown in color, and it has beautiful wooden handles and is decorated with a string of beads and a fox, It has a great convenient pocket in beige color. The towel has an owl attached. The set includes: a candle, a large bag, three candles, a soap, a bottle of oil, laurels, pants and towels. https://www.preciousandpretty.com/2018/07/animals-baptismal-set-for-boys-E815.html Greek Wedding Favors|Orthodox Crowns|Stefana|Baptism Invitations Animals baptismal set for boys E815 Baptismal set for boys, with cute animals on. Product #: Greek Wedding Favors|Orthodox Crowns|Stefana|Baptism Invitations_4099222823086743694 5 stars out of 5 reviews.